New relationships are to be celebrated and this season is the perfect time to say, “I’m glad you’re in my life!” with a little something under their tree. 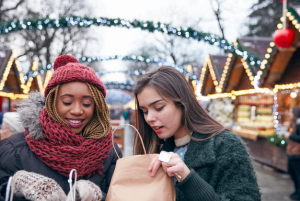 While giving a gift is fun, finding one can be a challenge if you haven’t learned the interests of your new co-worker, daughter-in-law, or neighbor. Have no fear! Macys.com has endless choices at our fingertips. Read on for foolproof suggestions that will knock their snowman-socks off and leave your new friend feeling special and appreciated. There’s an old stereotype that says men are hard to shop for but that’s not necessarily true. Fellas are often straightforward and appreciate quality, functional gifts. If you know he nerds-out on a particular sports team, cult film, or has an obsessive hobby – your job becomes even easier! 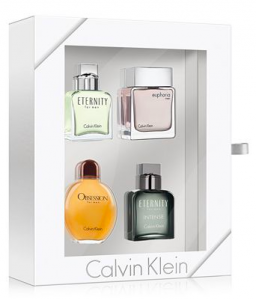 A cologne gift set is great for travel and feels like several presents in one. The perfect way to sample scents, he’ll appreciate your help discovering something new! Stylish socks that are festive or have a pop of color are a merry addition to any man’s closet. Despite his everyday attire, you’ll put pep in his step with a party on his feet! Support his next excursion with a handsome travel kit. Whether he’s a heavy or light journeyman, everyone needs a travel bag to get them from A to B and a quality kit will last him for years to come! Every woman deserves to feel pampered and beautiful – whether she’s a girly-girl, a tomboy, a CEO or college student. Because countless women forget to take time out for #1, you’ll become her hero by gifting her with something she might not buy for herself. Bath sets are welcome in any woman’s domain. Most come beautifully packaged for an impressive presentation, like this adorable birdcage-inspired bath set. Unlimited massages. After a long day of work, what better gift to have waiting at home than a massager? Back, feet, neck – you name it – she’ll thank you well after Christmas is over. Liven up her daily routine by adding a decorative flair to common items – like an artistic S’well water bottle, this chic Kate Spade mail tray, or a gorgeous picture frame. White Elephant parties are a hoot, so don’t let the pressure to find something for everyone stress you out. Certain pleasures are universal and these gifts will have everyone fighting over yours to the very end. Bluetooth speakers are all the rage and because they come in a variety of shapes, sizes, and price ranges – you can’t go wrong. If you meet someone who doesn’t love candles, don’t trust them. Candles are decorative, functional, and smell divine – making them the perfect unisex gift. A cozy throw blanket is like a warm hug – welcomed by anyone at any age. Since it’s a home accent, you can go with neutral tones or a splash of color! Get extra fancy with this faux-fur beauty from Madison Park. You don’t need to know the latest kid trends to impress the little ones. Children want to play and if you can help them do that, you’ll end up with a new best friend. Games that involve the imagination are great for children. Choose one with creative twists and you’ve got a winner, like Melissa and Doug’s Doggie Detective game. Adults only wish they could wear kid’s pajamas. 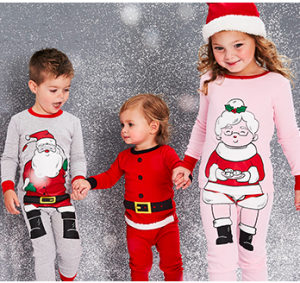 Help children celebrate their youth with a fun set of PJ’s that they’ll beg their parents to let them wear to school. Impress the child (and parent) with toys that teach. There are more options than ever – from animal puzzles and musical cubes, to a take-along play mat. No one’s personality fits into a perfectly wrapped Macy’s box, so have fun swapping categories around. For example, your mother-in-law might turn her nose up at a bath set but you just know she’d love some Bluetooth speakers. Infuse the spirit of play into your gift hunt and you’re sure to find the perfect gift!